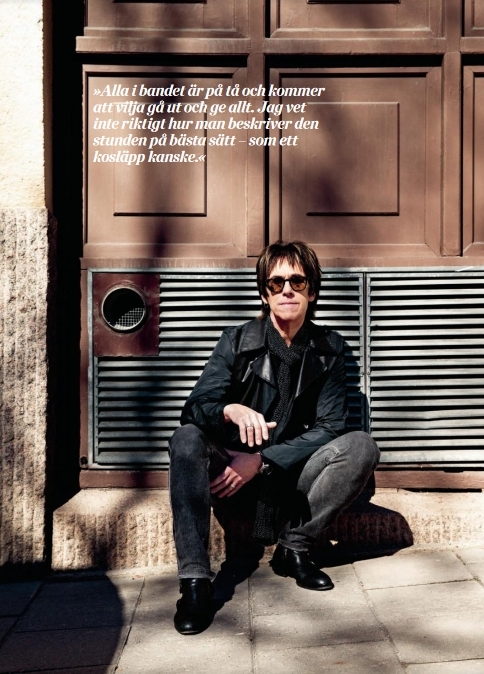 In the latest issue of Swedish Kupé magazine there is a short interview with Per Gessle. Actually, Nicolas Jändel, the journalist left Per’s thoughts in a first person narrative form, so it’s more like Mr. G telling his own story of what music means to him, he talks about songwriting, his new albums and the summer tour. HERE you can read the original text in Swedish. From this blog post we can see that the interview was done in April. Per tells Nicolas that during Roxette times they were standing on stage in front of 50-60,000 people in the crowd. Per says he can’t think of anything that could beat that feeling, but he would still play if there were only 20 people coming. Mr. G says it’s gonna be fun to be on tour again. The tour starts on 6th July and when they will be standing backstage before the premiere in Helsingborg and hear the noise in the crowd, they will feel the energy and will be excited to go up on stage and give their best. Per says he doesn’t know how to describe that moment, but it might be similar to when cows are let out to grass for the first time during the year. Per says all his Swedish solo albums are holy things and the songs are his babies. Now he wanted to write in Swedish again and record at a new place after spending more than 400 days in Christoffer’s studio during the past years. He decided for Blackbird Studios in Nashville. Per had the basic material ready, but wanted to go to Nashville with an open mind. Mr. G says when you have musicians like Dan Dugmore in the room and he is playing, you have to cry, it feels so great. It’s the same with the duets. Having another artist in the song gives another perspective. Per mentions he has duet songs with Lars Winnerbäck and John Holm. There are similarities between Mr. G and John Holm, e.g. they both have strange voice. Per tells Nicolas he worked a lot on the lyrics, as usual. The texts are in focus for him and are still about the same big questions as when he was young. Disappointment, love, sorrow and dreams, but from another point of view now, when you can no longer write about the first love. The meaning of music hasn’t changed for Per, it’s still extremely important for him. He can’t even imagine life without music. Music can make people dance or cry. It brings people closer to each other. He can’t see any other art having the same effect. Per tells the story when he and his friend were troubadours and played at nursing homes for old people. Once they found themselves in a room where only two patients were present. They were both sleeping, but Per and his friend started to play anyway. They played until a nurse rushed in and kicked them out. Right before they left the room, one of the patients woke up. It turned out he was in coma for months. Music can be so great. Mr. G says Sommartider was the first real summer hit, then came some more. In the ‘80s it was natural to write summer songs and play them in parks. It was about writing major songs that make people sing along. He says it was similar with Roxette’s Joyride, The Look or Listen To Your Heart, the songs which have big choruses. PG photo in the article was taken by Andreas von Gegerfelt.